This article is a review of the supplement OptiMind. This product contains ingredients that unleash the mind by causing calmness and increasing focus. It also clears brain fog. Read further to learn more about OptiMind. GABA- Plays a vital role in inhibitory processing, inhibits adrenal fatigue and relieves anxiety, and also decreases blood pressure and aids in the production of insulin. Phosphatidyl L-Serine- Vital component of cell membranes. It is responsible for signaling and communication between cells and improves memory, enhances focus, and reduces stress. Vitamin D3- Promotes healthy bones and aids in the absorption of crucial minerals such as zinc, iron, and calcium. It also helps in immune function and cell development. Alpha-lipoic acid- Plays a vital role in carbohydrate breakdown, which ensures that body cells have enough energy. It also protects neurons from free radicals that cause damage. DMAE- Protects cell membranes from free radicals. Caffeine- Stimulates the CNS, restores alertness, and eliminates drowsiness. Huperzine A- Improves cognitive function and memory. It also increases the levels of acetylcholine, which is necessary for thinking. Choline- Improves mood, intelligence, and memory. It also aids in the formation of cell membranes. Niacin (Vitamin B3)- Maintains healthy cells and helps in the breakdown of fats and sugars. This vitamin is good for eye, skin, and hair health. It also benefits the digestive system, nerves, and DNA. Tyrosine- Improves mental alertness and focus. Tyrosine also reduces stress. Taurine– Protects cells from destruction and aids in blood pressure regulation. It also improves endurance and performance. Vitamin B6- Enhances memory, alertness, motivation, and mood. Vitamin B12- Enhances mood, memory, and energy. It is also needed for blood formation, cellular metabolism, and DNA synthesis. Sulbutiamine- Improves memory, mood, and energy. Bacopa monnieri- Enhances memory and cognitive performance. It is also an antioxidant. Green Tea Extract- Has antioxidant properties and other protective properties. It also acts as an energy booster. Users should take two capsules per serving. However, it is advisable to start with one capsule to see how the product works before trying two capsules. Users can also experiment with different quantities to discover the ideal dosage. The manufacturer claims that there are few reports about negative side effects. Some people may be sensitive or allergic to some of the ingredients. People under 18 years and pregnant women should not consume this product. One bottle containing 32 capsules costs $43.31. Two bottles containing 32 capsules each cost $63.65. This is a reasonable price considering the quality and quantity of the ingredients. Shipping is free. OptiMind has 100% satisfaction guarantee, which signifies quality. We also identified several positive reviews that show that OptiMind is an effective product. 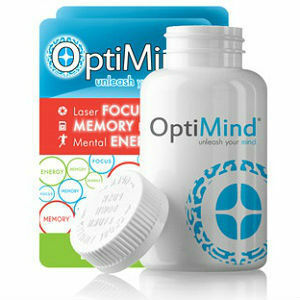 OptiMind is a suitable product for unleashing your brain in addition to performing other crucial functions. It uses a strong blend of scientifically supported ingredients. Other positive features of this product include free shipping, 100% satisfaction guarantee, positive reviews, and a free 14-day trial. However, there is a chance of experiencing undesired side effects. Moreover, users are free to experiment with different quantities, which may lead to misuse. Henry Costa	reviewed OptiMind	on June 29th	 and gave it a rating of 3.